Can My Treadmill Cause Foot Pain? “I’m finally working out and now my foot hurts”. This is a common complaint this time of year. Its winter and you want to be more physically active in the gym so you resort to getting on a treadmill and often times you find that to work harder you increase your incline. Okay, let’s address that. Should you quit working out? Absolutely not, keep going! But, here are some things to be aware of. 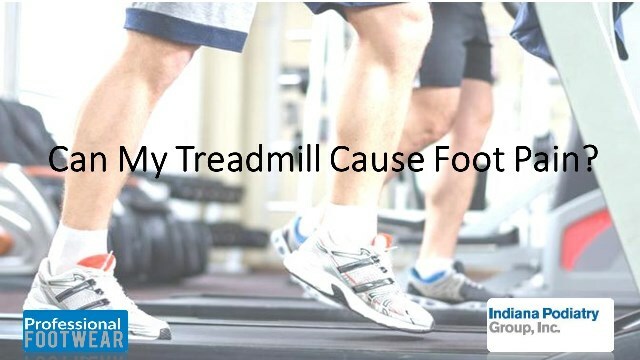 Treadmill use increases the amount of repetitions your foot undergoes. You see, your daily routine continues despite the use of a treadmill and the addition of treadmill exercise can add a significant number of repetitions of steps to your foot. The added incline then further adds greater mechanical strain and biomechanical injury. The next day or even several days down the road, you notice pain in the heel. What can you do to keep going? First, decrease your incline. Stretch your calf with a Thera-band or a stretching splint, maintain biomechanical control with orthotics, use ice and NSAIDs to combat inflammation. And if all else fails, seek your nearest podiatrist to help you out for more treatment options.